From one madcap taxi ride to Randwick Pavilion to regrettable post drinks at an open-till-5am bar on Oxford Street, the Eureka Awards Dinner is pretty much one of the best parties in town. Established in 1990, the Australian Museum Eureka Prizes are awarded annually to those with outstanding achievements in science and science communication. This year the highlights included chickens with feelings, photogenic insects and nicely-dressed scientists as far as the eye could see. I love a nicely-dressed scientist. Sitting at the Science Week table I learnt about Questacon’s badly-behaved talking robot who said inappropriate things to children before they removed and reprogrammed him, and watched the 19 prizes being handed out over dinner. Given that chicken was being alternated with barramundi that night, I’m assuming they switched meals with whomever was sitting next to them while they waiting in the queue for the bathroom. “What’s barramundi?” friends from Europe asked me. A world-first collaboration between a cattle breeder and six scientists won the Prize for Research by an Interdisciplinary Team for their work with Meat Standards Australia, and Amanda Barnard from CSIRO the prize for Scientific Research as she develops an invisible, environmentally friendly sunscreen. I visited the COSMOS table up the front where things were getting suitably anarchic, before the saddest moment in the evening when our two nominees for the Science Journalism Prize, John Pickrell and Elizabeth Finkel, were beaten by the ABC. Read Pickrell’s incredible piece on feathered dinosaurs and Lizzie’s elegant exploration of genes here and here. I tweeted/texted double sad faces from across the room. Guys, I’m not that clever. Sorry. 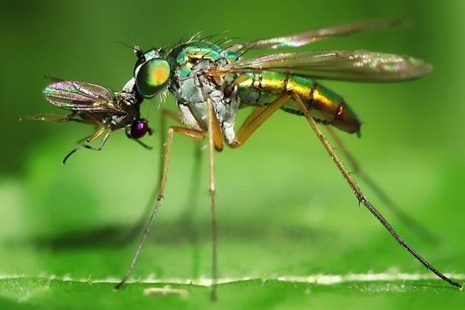 My favourite winner of the night was Roz Batten, her image of a long-legged fly consuming its prey awarded the Prize for Science Photography. “Collaboration? !” a text from across the room suggested. I did like Batten’s comment that she’s hoping for a time when images of insects will grace the walls of people’s homes like landscapes and portraits. Right on, Batten. Sleek Geeks, Karl Kruszelnicki and Adam Spencer handed out the Primary and Secondary School prizes, the winners and finalists all having to come on stage under the rather cruel stipulation that they wear their school uniforms. Their kingdoms for a science prom dress indeed. The lights came on and we were pushed further and further to the back of the room by chair-stackers before merging with the only other table that was left – ABC’s Catalyst. We were unceremoniously kicked out with a, “Who are you people?? Leave! Leave!” Given that I was battling through a red/white mixture that another certain colleague had inflicted upon me at the time, it wasn’t entirely unwarranted. With $190,000 worth of prize money handed out to the top scientists, researchers and journalists in the country, it was such a privilege to attend this wonderful celebration of Australian science and science communication. Better luck next year for COSMOS writers, hopefully. Full list of prize winners here. / Gallery of Science Photography finalists here. * Neither were those people stealing chocolates from your table, collapsing on the red carpet or high-fiving academics. I also sure know how to be hungover. I’ll have to try to attend next year and represent CSIRO Ed. I’m always hearing how they’re a blast, but never find the time to make it to one. BTW, you might want to edit the first instance of John Pickrell’s surname (unless it’s an intentional jab at the poor guy…). OH DEAR GOD. WORST TYPO EVER!!! Thanks for the tip!